It’s been a few days now since the Nate Frazier news dropped. The team is moving on, as is Nate, although his first plan appears to have been derailed. There really isn’t all that much else to say on the subject, but it just feels like there should be more. Where’s the analysis? What’s the impact? The truth is that we’ll never really know. The one thing we do know is that whoever steps in at nose guard– whether it’s Chase Burge, Jordan Stephens, someone else, or most likely a combination of the three– is not only getting a tremendous opportunity, but is also going to be stuck with hearing “if Nate was here” from fans all season (see: Johnson, Paul). That’s unfortunate, even if it sort of comes with the territory. It’s hard enough to replace a player as good as Nate. It’s almost impossible to measure up to the mythical image of Nate that people are inevitably going to develop (if they haven’t already). There’s a reason for that, of course. Navy doesn’t usually get players like Nate Frazier. The stereotypical Mid is undersized and overachieving, but at 6-3, 290, there is nothing undersized about Nate. That isn’t a lardball 290, either. Nate is as solid as they come. And last year, we started to to see the realization of the potential we had been told about since he was a plebe. He made the transition from mere block-absorber to genuine playmaker, especially in the second half of the season. Nate was going to be the anchor of what we all expected to be an excellent defense in 2009. Those are some big shoes to fill. Even with the loss of Nate, though, this is still going to be a very good defense. The secondary is deep, the linebackers are rangy, and the line is experienced. Whoever steps in at nose guard doesn’t have to be Nate Frazier; he just has to do his job. The team around him has plenty of playmakers. Maybe it won’t be an elite defense (by Navy’s standards), but it should still be very, very good. Still, if there was a time that you wouldn’t want to lose a defensive star, it would be this season. Navy’s production on both sides of the ball has been fairly consistent since 2003. The exception was, of course, 2007. The 2007 offense was as experienced as they were talented, but the defense had new faces at almost every position. The end result was somewhat predictable, although maybe not to the extent that it played out. That year, the defense was atrocious, but the offense was virtually unstoppable; the two extremes averaged out to another successful, 8-win campaign. This season, we have the opposite; now it’s the defense that will presumably need to pick up some of the offense’s slack based on their relative experience. Of course, the coaches aren’t heading to Columbus resigning themselves to trying to win every game 14-13. They have a wildcard to play in their attempt to make up for the inefficiencies of inexperience. That wildcard is the passing game. We are going to continue to do what we do. Ricky has a skill set that is a little different than some of our past quarterbacks and that will help us in the passing game, although we aren’t going to turn into Texas Tech or anybody. We will probably throw the ball a little bit more, but we know for us to be successful we have to run the ball and there is a whole plan behind it and why we do what we do and what we are trying to get accomplished. Our offense isn’t filled with bells and whistles and it isn’t real fancy, but we just want to win games. Of course, the Mids don’t have to turn into Texas Tech for Navy fans to sit up and take notice; even passing 20 times a game would be a huge difference. While there’s no value in throwing more for the sake of throwing more, it wouldn’t make any more sense to leave your quarterback’s best asset underutilized, either. As we all know already, Ricky Dobbs has a great arm. The great experiment is to see if that shoulder-mounted rail gun of his can offset the growing pains that come with learning the finer points of the option game. I think it can… In theory, anyway. I’m not so sure that it will. 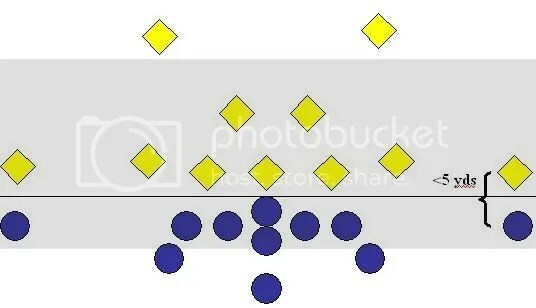 Here’s a somewhat crude diagram of a 3-4/5-2 look lined up against the base spread formation. The wide receiver would block the safety, while the slot would arc block the cornerback. <tangent> Although you’d think that it would make sense for the wide receiver to just block the guy lined up right in front of him, there are a couple of reasons why that isn’t how it works. First, it takes time for the option to develop and read its way outside. It’s very difficult to engage in a block right after the snap, then maintain that block for the length of the play. That’s also why the A-back takes an arc path to the block; if he ran right at the cornerback and cut him immediately, he’d have time to recover from the block and get back into the play. You want to your block to be timed so that the ball carrier is running by when your man’s face is in the grass. Different play, obviously, but it’s the same concept. 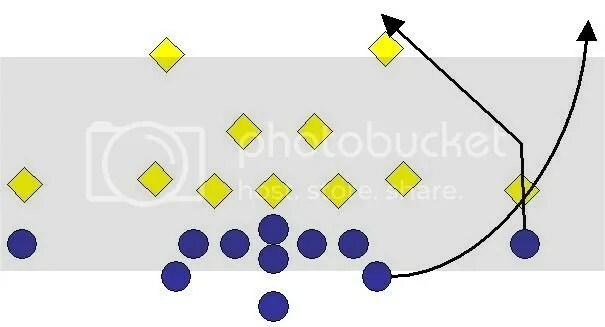 The play action can be particulary effective against overzealous cornerbacks. 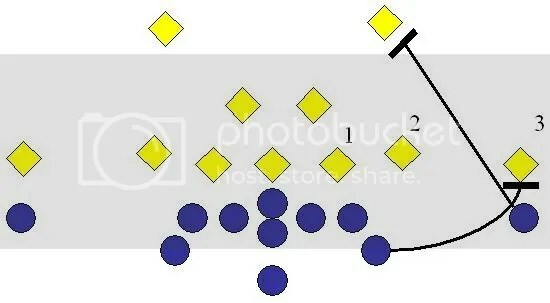 When the corner blitzes, the safety can cover the wide receiver, but it leaves the slot to be covered by a linebacker. Assuming your slotback doesn’t have a plow attached to his back, that’s going to be a speed mismatch. That’s what happened against Notre Dame in 2007. Late in the game, the Irish started blitzing the play side cornerback. In overtime, the Mids ran toss sweep play action to draw in the cornerback. This left a linebacker to cover Reggie Campbell, which isn’t something most linebackers would want to do. OK, so we’ve seen how the option sets up the passing game so well. So why the concern for 2009? Well, in order to succeed on a passing play, you need three things. One, you need receivers to get open. Got that. Two, you need a quarterback that can deliver the ball. Got that. Three, you need to protect that quarterback. Got… problems. Giving up a sack every 5-10 times you drop back to pass is bad. It’s really bad if you intend to drop back to pass more often. 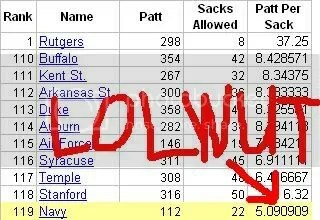 There are a few reasons why Navy is ranked at the bottom of the list every year. 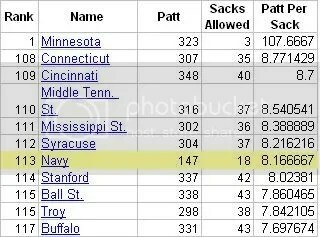 Navy has far fewer passing attempts than the average team. Navy might throw 100-150 passes a year, while others might drop back 300-400 times. So when Navy drops back, you know they’re trying to make the most of the attempt. That’s not necessarily the case with everyone else. Teams that throw 30-40 times a game incorporate a lot of dink-and-dunk stuff that Navy doesn’t bother with. Those kinds of plays– short-yardage quick-hitters where the quarterback gets rid of the ball sooner– are less likely to result in a sack than when the QB is holding onto the ball longer, waiting for his receivers to get downfield. The latter is the bulk of Navy’s passing game. 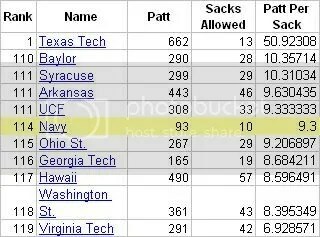 Mix in that 1) the kind of offensive linemen ideally suited for blocking ankles aren’t really built for pass protection, and 2) Navy, who runs the ball 50 times a game, just doesn’t spend as much practice time on pass protection, and it’s no wonder that they give up a lot of sacks. So there’s the challenge. No matter what the reasons are, they will have to be addressed if the Mids are to be able to make the most of Ricky Dobbs’ arm. Sacks are drive-killers, and QB pressure leads to turnovers. Will throwing more passes mean incorporating more short-range throws into the offense? If it does, it will help with the sack problem… But then the question becomes whether you’re getting the big-play value you were hoping to get in the passing game. The Mids averaged an amazing 17 yards per catch last year, second only to Georgia Tech. While the potential is there for the passing attack to boost a young offense’s production, it’s just as possible that throwing more just means trading one set of problems for another. The key for the coaches will be to manage risk vs. reward. Please hear me out on what could be a great solution to replacing Nate Frazier. It is, however, based on the assumption that Walsh and Nechak are and will remain healthy. Switch Tuani to nose as his quickness, instincts, and experience (42 tackles in ’08 including 9 TFL) will give opposing offensive lines fits. He is Navy’s best and most versatile defensive lineman. This will allow Walsh to to play left end. He has a ton of experience and had 57 tackles including 10.5 TFL and 3 sacks in ’07 (his last healthy year). Nechak is also experienced (39 tackles including 8.5 TFL and a team leading 4 sacks in ’08) and can retain his position at right end. This appears to be the most logical way to replace Frazier’s 44 tackles and 9 TFL. Although they are both fine players and prospects, Burge had only 1 tackle last year and while Stephens tallied 3. I think I’ll defer to Coaching Staff for this one, you know the guys who get paid and actually see the parties involved every day. Nothing wrong with wondering what the best combination would be along the line. I would say, though, that just because Burge & Stephens don’t have as much game experience, that doesn’t mean they’re not the best choice. I wouldn’t be surprised to see Tuani, Walsh, and Nechak in at the same time when it’s an obvious passing situation. Yes, they are all going to get a good amount of time. That unit still has a lot of depth and it will be a blessing against big, physical teams like Ohio State, Pittsburgh, and Notre Dame. Bookhout, Marshall, and Yarborough are going to be in the mix too. Jabaree, listed at 265 splits the difference between Jordan Stephens and Chase Burge. In addition, he can better use his speed on the outside (cf Wake Forest game). Also, I seem to recall us getting sacked more often when we aren’t passing on our own terms. If we are forced to throw, it gets very scary for the QB. Great analysis of the wheel-post . 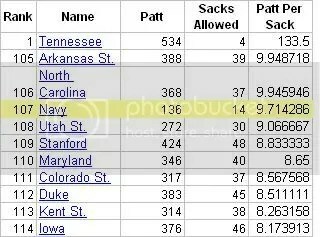 . . and Navy’s sacks and pass blocking. I like the strategy that says to pass when the defense opens the door or displays its vulnerability, but otherwise work the ground option. Navy passed about 10 times per game from 2004-2008, slightly more than twice each quarter on average . . . last year less at only 7.2 passes per game. It should be noted that individual game stats are more telling than season totals. For example, in 2008, in games where Navy is ahead in the 4th quarter, Navy averaged 4.4 passes per game. When Navy was behind they averaged 10 passes per game. In 2009, if we throw twice a quarter “normally” (when winning or within a touchdown) then we are doubling our rate from last year . . . three times a quarter would be tripling the passing rate! Hopefully we won’t be far behind in the fourth quarter. Perhaps the a few more passes during the game will keep us more competitive against some of the big opponents this year (OSU, Pitt, ND) so that we don’t have to play stop the clock in Q4. The beauty of the wheel and post is it is such an easy 1-2 read for the quarterback. Who are the top ten active coaches in Division I-A/BCS football ranked by winning percentage (they must have coached for at least five years)? Considering the source, #1 should be easy. My next post will list them in order–I think you guys should find it interesting. Mike, let me kjnow if this type of post is out of line. I’d prefer we stick to the topic. We have a separate message board for stuff like that. Great analysis of the potential pros and cons of the Ricky Dobbs Experience. Do you think that the amount of sacks given up has been greatly influenced by factors specific to the QBs (instead of the O-line): particularly locking on to one receiver or not being willing to throw the ball away? 10-4, Mike. The interesting part of the list is that Paul Johnson is #10 with a .739 winning percentage over 10 seasons. I don’t think so. I didn’t go back that far, but the numbers are the same back to 2002. It’s been consistent with each quarterback. And you’ll notice last year that Georgia Tech had similar numbers. That’d seem to indicate a more systemic issue. so can we expect a breakdown of the new o-line sometime soon? And do you think the game plan blocking scheme against OSU will be any different given the size & strength of their line compared to most of our first 7 opponents (save Pitt, possibly)? Just curious if you or anyone else has seen anything different up front given our possible airing out on offense. In recent years we, the confirmed fans of the BUCKEYES never really know which team will show up? One thing you can count on is that Pryor will be much better this year then last, did I mention he is the FASTEST man on the squad. The boys of the Olentangy better be ready. I will never forget the N.D. game, LOVED IT. GO BUCKS……..
p.s.I will stand and cheer for the Middies when they take the field as will most all OSU fans. GO NAVY (game two). Looking foward to seeing the boys run out on to the field at the Shoe. Are you going? You said, The playside slot is responsible for blocking the run support when the CB is great than5 yards off. Does this happend even in short yardage (non typical passing) situations? If you call the triple, yes. The offensive line is pretty much diving at he ankles of the opposing defensive linemen. I Would think that that makes it very difficult to pass block. Another great example of the wheel–post being run to perfection was during the 2003 season against one of the geographical Michigan’s. I think it was Central MI. Their punter pinned us inside our 5 yd line. Candeto made a great fake and hit the WR on the left sideline that WENT… ALL… THE… WAY… My cell phone rang with a call from a customer just as the play was starting. Between the crowd going crazy around me and trying to explain to him why I couldn’t talk, it got quite interesting. I imagine it stands as the longest pass play in Navy history, or at least very close. as usual, spot on ! … this should be an interesting season; but, then, they all are ! * I am not sure that throwing a time or two more per quarter will change the way defenses prepare for Navy O. I think it’s the “situation” that will determine it. When we’re 3rd and 4, do we tend to run the triple or do we throw? On 3rd and 8 is it a given we throw? And if we do, do we start to do straight pass protection? That’s what defenses will break down in film and use to prepare their keys. * Even if we throw more often, if the situation remains the same driver of the play call (wheel route, great example), the pass protection techniques will remain the same as deployed this year (three point stance, “look like run”, lock up with your man then ride like heck), the sacks should continue as well as the “big yardage average”. If, however, the situation “changes” (3rd and 4 means straight drop back or roll/sprint out…) you have another problem… see next (and last) bullet. * If we change, or even mix, the situations in which we throw, requiring straight drops/rolls by the QB, the protection both technique and scheme will have to change to address the sack problem you clearly illustrate (two point stance, zone scheme, pocket protection). That requires a GREAT DEAL of practice… and with limited practice time, I don’t know how you can do it effectively. …. so… my vote (which counts not much) to pass slightly more frequently, in only the same situations.